Pomegranates make interesting inspiraton for jewelry. Pomegranate jewelry holds a special place in many cultures. The distinctive shape and color also makes the pomegranate an interesting design inspiration for many jewelry items. The pomegranate is an ancient fruit and references to the fruits and the tree are found in ancient cultures from around the world. The pomegranate also has a special meaning in many cultures and religions. In Judaism, for instance, the pomegranate is often eaten on Rosh Hashanah. It is also the symbol of fruitfulness. Pomegranates are also prominent in the Greek culture, used as food or as decorations during many celebrations. The special symbolism, combined with its attractive and interesting shape makes pomegranate jewelry an interesting choice. Gemstone Set Jewelry - One of the most distinctive features of the pomegranate is the mass of bright red seeds. These are often used as a design feature and many items of pomegranate jewelry are set with red stones. The type of stone varies and this will alter the look and the cost of the piece of jewelry. 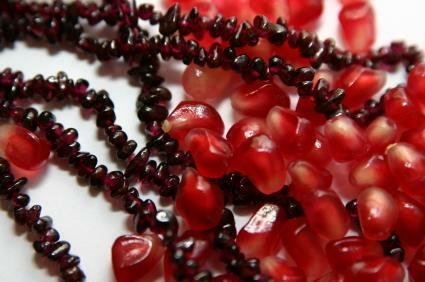 Rubies are often used in high quality pieces of pomegranate inspired jewelry. These are bright red and are typically cut into facets that reflect the light and cause the stones to sparkle. Garnets are also reminiscent of pomegranate seeds, making garnet beads an attractive addition to jewelry inspired by this fruit. Low cost alternatives include red quartz or synthetic stones. For a unique effect, look for jewelry that features enameled pomegranate seeds. Precious Metal - Jewelry with pomegranate designs is made from a variety of different metals. Base metals are options for inespensive items of jewelry, however they are generally of lower quality and are not suited to everyday wear. Precious metals, such as gold and platinum, are of the very best quality and can be worn everyday, however, the cost is significantly greater. One of the benefits of yellow gold is that it complements the bright red seeds and creates an attractive finish. Style - The pomegranate shape lends itself to both contemporary and traditional styles. If you are buying a pomegranate item as a gift for another person, consider what style of jewelry they normally wear and try to match the pomegranate to this. The pomegranate shape can be stylized or realistic. The designs can also be very ornate or more classical in shape. If the pomegranate is to be worn only for special days then large and dramatic designs will work well. Everyday wear may require a more subtle design that will not catch on items of clothes. Does Brighton Jewelry Have Outlets? Vanessa Amalia - There is a good selection of different types of pomegranate designs. 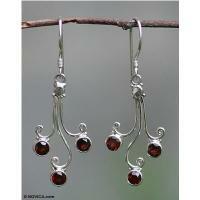 The range includes silver jewelry with bright red gemstones. Vosgeenoor - Gold and silver pomegranate designs are available from this website. The range includes classic and contemporary designs. Hamsa Designs - A selection of Judaica jewelry including items featuring pomegranates. Whether you are buying a piece of pomegranate inspired jewelry because of the symbolism or simply because it has a unique look, the range of options means that there is bound to be a stunning piece of jewelry to suit your style.